Years of working around firearms can permanently damage your hearing. 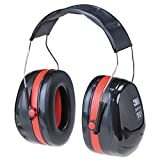 The vendors listed below manufacture and sell hearing protection equipment which functions to block the damage done by extreme sounds such as gunfire, while electronically enhancing more moderate sounds such as the human voice. These most miraculous advances of science help to improve our lives both today and in the future. Peltor manufactures a complete product line of hearing protection and communication products for anyone who spends time in noisy environments. Peltor’s goal is to provide the greatest possible comfort, security and safety, while increasing the wearer’s enjoyment. ESP Products use a small electronic hearing protection system that reduces the ear-damaging noise of gunfire, yet amplifies natural sounds like speech, allowing shooters to converse in normal tones while continuously wearing their hearing protection. E.A.R. Inc. was developed to support the needs of major corporations attempting to comply with state and federal regulations regarding hearing protection. Peltor hearing protection products have lead the way in hearing protection products for years. These products are the choice of law enforement, the military and shooters across the globe. The Tactical 6-S hearing protector features a noise reduction rating (NRR) of 19dB. It electronically suppresses sounds over 79 dB. Maximum distortion-free amplification of low level sounds up to 19dB. Stereo microphones provide direction-sensitive sound. Easy to use volume control and padded stainless steel headband. Originally designed for the shooting sports industry, E.Muffs are the new electronic hearing protectors that amplify low to normal conversation levels and range commands utilizing a built-in microphone. When noise levels exceed 85db, the solid state circuitry automatically, and instantaneously, shut down the mic., preventing potentially hazardous noises from damaging the ear. When noise levels drop below 85db, the control unit restores normal operation within milliseconds. E.Muffs are also great for use with power tools, chainsaws, heavy equipment and machinery, indoors or out. Peltor tactical hearing protectors. 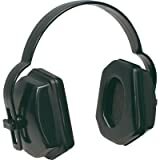 The “Listening” muffs that helps protect against harmful noise while amplifying low level sounds. This is a real plus for shooters with less than perfect hearing. Electronics limits amplified sound to 82dba. Amplifies low-level sounds up to 25 dB. Features include stereo microphones for directional sensitive sound, long life battery power and easy to use volume control. Padded stainless steel headband. The performance of the Tactical hearing protector has led the way in the hearing protection industry for years and helped make them the choice of law enforcement, military, and shooters all over the world. Protects from both continuous and impulse noise. Maximum amplification can be incrementally adjusted down to the “off” position. Advanced electronics enable amplification of weak signals but will not exceed 82 dB(A) equivalent sound level. Wide, soft padded headband distributes weight while two-point suspension exerts low pressure for comfortable, long-term use. Soft, liquid foam-filled ear cushions provide added comfort. Long life 9volt battery included. 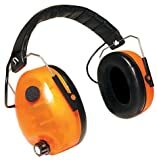 Assists people with impaired hearing. Perfect for shooting and hunting. Noise reduction rating of 22 dB. Adjustable headband, cushioned earcups. U.S.A.
Because your hearing is often taken for granted and is permanently affected by loud machinery and noises at work and at home, we’ve added some great Peltor products to protect your hearing. The Deluxe Personal Hearing Protector is inexpensive, comfortable and provides excellent attenuation at low and high frequencies. Noise reduction rating is 27 dB. The Twin Cup Design provides ultra-high attenuating hearing protection and has a noise reduction rating of 29 dB. The Work-Tunes Hearing Protector combines hearing protection with your favorite AM and FM radio station. AM reception is crisp and clear for listening to sports and talk radio. Noise reduction rating is 25 dBA. Peltor’s Listen-Only Headset is designed for industrial users in high noise environments and combines the highest quality audio reception with a wide selection of connectors so it can be used with speaker microphones, VHF/UHF radios or personal entertainment devises in high noise areas. Noise reduction rating is 25 dBA. The Surround Electronic Headset is specifically designed for industrial users in harsh environments and provides electronic suppression of dangerous impulse noises to 82 dB while amplifying ambient surrounding voices, signals and warnings. It also has an audio port for radio connections.